Product prices are flat rate, no additional fees per User. Please Contact CAL for Pricing Information. 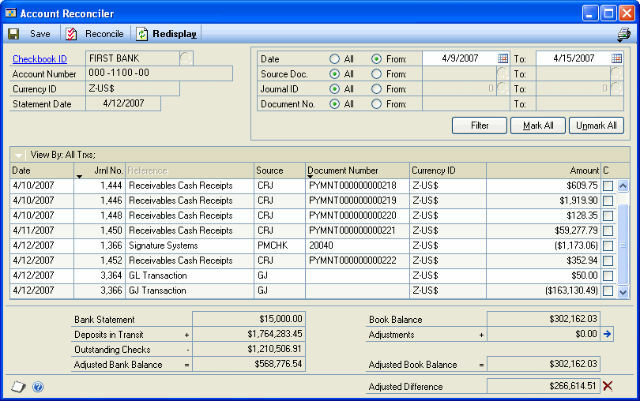 Account Reconciler benefits those who need to, Reconcile transactions recorded in the GL in originating or functional currency without a separate sub-ledger and/or need to automatically match electronic files received from financial institutions with Dynamics GP checkbook transactions. Account Reconciler reads the Microsoft Dynamics GP General Ledger year‐to‐date transaction open file to reconcile transaction information. The Redisplay process in the Account Reconciler window transfers all transactions that have not been updated since the last reconciliation into the Account Reconciler window and flags these general ledger transactions. We recommend that you update transactions to the Account Reconciler window prior to closing the fiscal year.